On 08 April 2019, Julian Pawlak was invited by the Polish Naval Academy and NATO Maritime Command to speak at the Gdynia Security Forum. Titled "We are maritime NATO", the conference addressed strategic challenges in the Baltic Sea region and the development of the Polish Navy. The event brought together a group of experts from Singapore, the US, Australia, Israel and Europe. On 30 January, Jeremy Stöhs was invited to give the keynote speech at the Strategic Maritime Seminar at the Royal Military Academy in Brussels. The naval officers taking part in the course discussed solutions of how to deal with the decline of European naval forces. On the day before the seminar, Jeremy Stöhs visited the naval base in Zeebrugge to gain first-hand insight into the close cooperation between Belgium and the Netherlands as well as their naval capabilities. Dr. Sebastian Bruns was interviewed on Defense News on the role of the Baltic Sea in the new strategic and geopolitical environment. On 16 January 2019 a delegation of international submarine commanders from Eckernförde visited the ISPK. Johannes Peters gave a presentation on the return of the “Northern Flank” as an operating area. This was followed by a lively discussion about maritime strategy and security, with Jeremy Stöhs and Dr. Sebastian Bruns joining the podium. 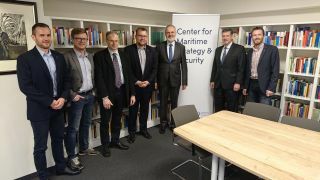 On 16 January 2019 a group of researchers from the Baltic states visited ISPK to discuss deterrence and maritime strategy in the Baltic. Dr. Sebastian Bruns, Johannes Peters and Julian Pawlak welcomed our distinguished visitors. Dr. Sarah Kirchberger was part of a German Think Tank delegation to visit Canberra during the last week of August. The group participated in lively exchanges and a conference with Australian counterparts from ANU, ASPI and various government institutions. 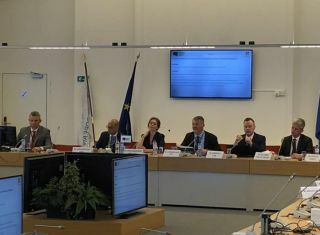 Dr. Sarah Kirchberger presented at a joint EDA/Hybrid CoE Workshop on „Harbour Protection under Hybrid Threat Conditions“ at the EDA premises in Brussels. 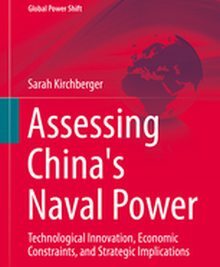 During 14-15 May, Dr. Sarah Kirchberger presented a paper on China's military-strategic interest in the SCS on a workshop jointly hosted by Institute of East Asia Studies, UC Berkeley and the Centre for Rising Powers, University of Cambridge named "Maritime Asia: The Securitization of the China Seas." The video shows the concluding public wrap-up session. 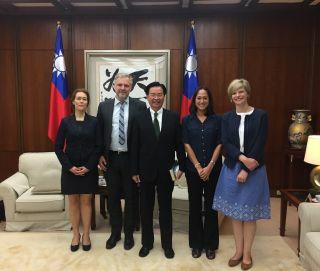 During the week of May 7th-11th, Dr. Sarah Kirchberger was part of a German Think Tank delegation visit to Taiwan. The four person group met with official representatives including the Foreign Minister, Dr. Joseph Wu, and also visited the Ministries of Defense and Economy, the National Security Council, the Mainland Affairs Council, several political party headquarters and think tanks. The delegation with Foreign Minister Dr. Joseph Wu. From left: Dr. S. Kirchberger, Dr. Bernt Berger, Dr. Joseph Wu, Dr. Angela Stanzel and Dr. Janka Oertel. On 2 May, Dr. Sarah Kirchberger presented on „A Tangled Web: China, Russia, Ukraine“ at the 3rd E-Workshop "Defense Industries in the 21st Century: A Comparative Analysis“ hosted by the Comparative Defense Studies Program at Columbia University. In The Decline of European Naval Forces, Jeremy Stöhs provide insight into the evolution of Europe’s naval forces since the end of the Cold War. 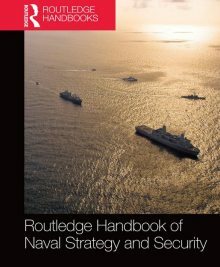 To illuminate the drastic changes many European navies have undergone over the last twenty-five years, Jeremy Stöhs analyzes the defense policies and naval strategies of eleven European states as well as the evolution, deployment, and capabilities of their respective naval forces. Dr. Sebastian Bruns wrote an analysis on the enduring relevance of the Falklands War for the US Navy. 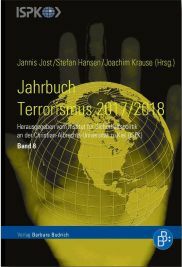 It was published in a Danish journal and can be downloaded here.